Phillip R | Kick Out At 2! Welcome back WCW fans! We’re here for another week of WCW Monday Nitro, coming to us from Landover, Maryland! 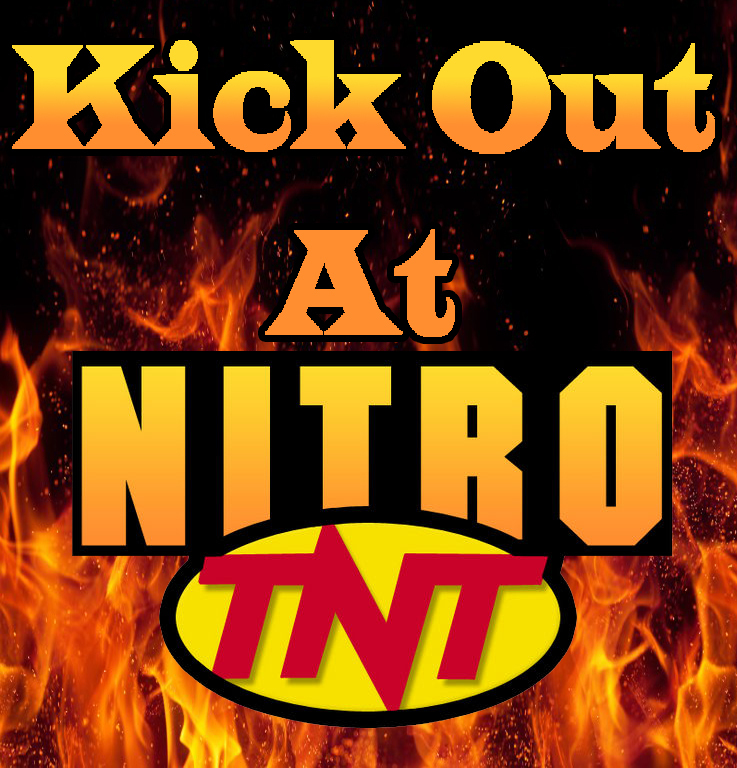 Taking the reigns of Nitro this week is Phillip! Open of show, Zbyszko and Schiavone, talking about the takeover. DDP is pissed because someone snaked his ring. No one can beat him, so they are going to steal it. Flashback to The Outsiders showing up during the tag team championship match. Zbyszko calling The Outsiders cowards, and talks about the upcoming “New World Order”, interesting to look back at a time where this wasn’t 100 percent a part of the lexicon of every wrestling fan. Steiner looks like the man who later become Big Poppa Pump, juiced to the gills! Harlem Heat, which is a real staple of this era, and possibly one of my favorite tag teams of all time. I really liked the dynamic; it’s interesting that you have a big and bigger man tag team. But damn is Booker athletic. Good action to open up this tag match. Some pacing to set up the break, this is a thing that is really common now, but I think was fairly new for this time in Nitro, the commercial break during a match. Steiners are running this with counts, but this match is not the potential of these two teams, a really transparent double axe handle. We have a lot of action outside the ring, there is a lot of focus on the nWo and Rob Parker outside the ring, but the action in the ring is still moving. Zbyszko calls out a “slow count”. Really pretty belly to belly off the top. Side slam, a really big guy off the top, it looked really good, way to go Booker T, and a really stiff double clothesline. Frankensteiner, this one looked pretty good, but Scott Steiner took a back of a head to the apron. Bulldog from Ricky, Parker interferes, and smacks Ricky with a walking stick. Mean Gene talking to the Horsemen, selling this 8 man tag that’s main eventing this Nitro. I have to say that seeing Benoit in Horsemen gear, and this opening up of the Wolverine is really exciting for me. “Silent but Violent,” he was one of my favorites around this time, he represents the archetype that I generally fall for. 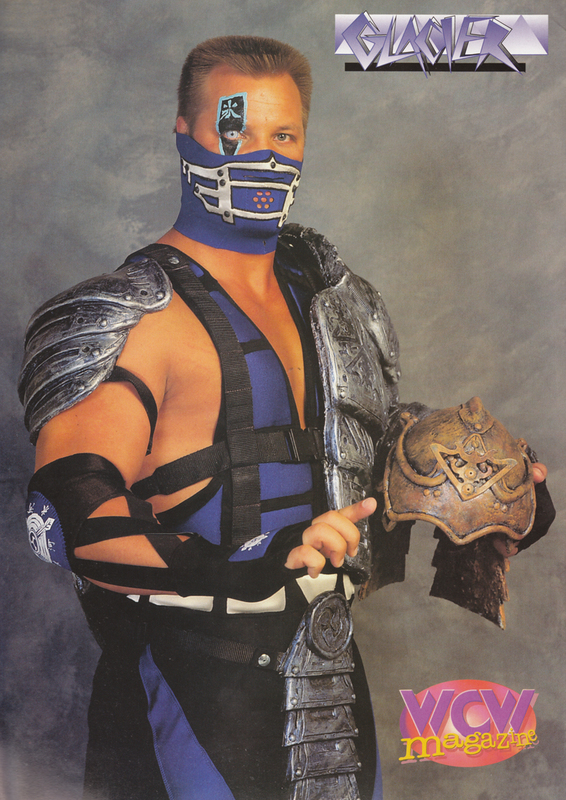 Glacier promo, this guy was hyped to death around this time, and really no one ever cared once he was in the ring… Turns out no one wanted a discount Sub Zero in WCW. It’s interesting, because they were playing both sides, this was before “reality” mattered and they are selling us a cartoon. Although I have to say the upcoming Mortis run is memorable. Disco asking if the crowd wants to see him dance, I personally don’t want to see him… anything. This match seems like something to watch while they sell storyline. Kurasawa is wrestling like a beast. Disco Inferno calls up his music, which apparently is tied to the Disco Ball, and smacks Kurasawa with the disco ball. Thanks to the distraction of… Spandex, and disco music. It’s odd to see Buff and Scotty as the American Males, I mean I think of Buff as nWo and Scotty Riggs as a part of the Flock… Hacksaw Jim Duggan talking crazy, typical Duggan. Page wrestling really physical during the open of this match, yelling about his ring. DDP yelling at the crowd, it’s odd that later in this run, DDP instead of yelling at the crowd will have literally everyone behind him. Page grabbing the ropes while stretching out Scotty Riggs, a little “Flair” for the stretch, pun absolutely intended. A really stiff clothesline. Riggs turning the tides, roll up splash over the top. Diamond cutter off the block. The move you can hit from anywhere. Interview with Mean Gene – Let’s talk about the ring… Taped fist bought with the bare fist brawler that is Jim Duggan. DDP frisking Mean Gene. Macho in war paint, throwing stuff off of the Horsemen table, that was paid for with his money. Selling the 6 man tag, to prevent the hostile takeover. The match moving pretty slow, the action taken outside, and throwing Savage on the rail. Savage going savage on the ground with punches, Savage slams him down, gets caught coming off of the ropes. 30 second countdown to hour 2. Valentine KO’s himself from a back suplex? Savage lays the elbow down as we reach hour number 2. Bischoff and Heenan kicking off our second hour. Bischoff talking about the show of support. 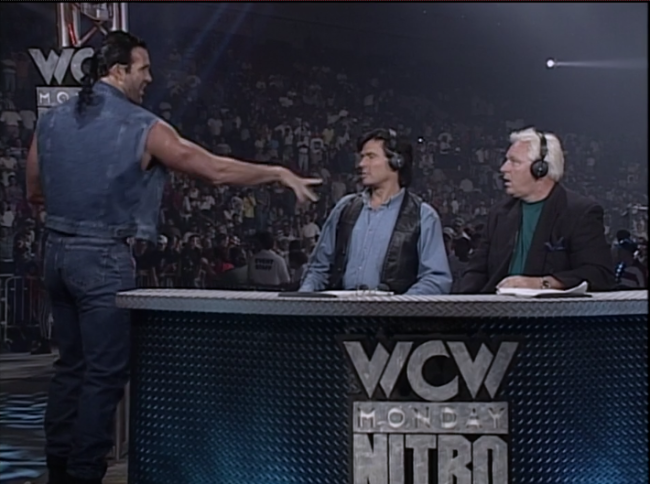 Bischoff addressing The Outsiders, calling out Nash (oddly naming him for the first time) for picking on poor lil’ Bischoff. Heenan is scared for his safety. The crowd going nuts behind Bischoff as Hall and Nash make their way down through the crowd. Hall and Nash apparently have tickets. These interruptions I think really help the format, pushing time so that you don’t get pulled too far away from the big story. Another Glacier commercial and surprisingly I still don’t care.. They are selling the shave job on Tenta, so much so that he may just beat Giant… Me thinks probably not. This thing moving slow as snail snot, while Bischoff desperately tries to convince me to care. Big Bubba comes out and shaves the beard of Tenta. Why this gimmick requires him to not just go all in and shave is beyond me. I mean this dude has a life, and I’m sure got no tail looking like a half shaved, overweight deranged homeless man. Dungeon of the Doom promo. We’re coming for the Horsemen, Giant is a lifelong champion, you don’t cross the Dungeon, Giant screaming with his incoherent giant voice. I mean really, just spitting, and screaming complete and TOTAL nonsense. Rey Mysterio Promo, which highlights why I wanted to be a cruiserweight in ‘96 interrupted by Hall and Nash. Nash taunting Bischoff. Calling Macho, Sting and Luger clowns. The crowd chanting “Diesel” while Nash chants “Attica”. I love that Hall and Nash really poke a finger in the chest of what wrestling is at this point. Jim Duggan found DDP’s ring. In the bathroom… umm, ok. But a man like Duggan, he wouldn’t wear this girly piece of jewelry. Page storms to take it and gets laid out by a taped fist. I don’t think WCW understands what tape does for hands. Apparently it gives you +5 KO power, and DDP’s taped ribs to come later give you +10 special, so that he can hit the cutter from anywhere. Mean Gene slips out a “King of the Ring” and Bischoff has to clarify so McMahon doesn’t sue the multicolored tights off of WCW. We get going, Gomez cleaning the ring. Enzuigiri takes down Arn. Benoit comes in to do some work, and Gomez works on Flair. These large team tags are usually just mayhem, and this one isn’t moving so quick. There’s some tags, and some light action that is just making sure the match moves. Benoit comes in to work over Gomez, looking a little violent, it works. Tags in Mongo, who’s laying a beating, tags in Flair, who beats on Gomez, and tags in Double A. Gomez, sunset flip with some help from Morton on Double A. Double A, nice spinebuster, and gets booted from the pin by literally the entire corner of Gomez. Benoit going a little crazy in the ring, looking rabid, they are really pushing Benoit into that role of the Enforcer. Gomez reverses the Figure Four, Gomez catches wind, and reaching for the tag, no go, gets choked on the ropes. McMichael throws the briefcase, hits nothing and no one, and somehow still throws off the Renegade and wins the match for the Horsemen. WCW, please stop trying to sell me a start up for a Create a Character in Joe Gomez. No one needs anymore of this Generic Wrestler A.
Horsemen shoot a promo on Dungeon and Konnan, and a general promo for the Horsemen body count. Bischoff closes the show to remind us about the 3 man Tag. I hate to second guess booking, but I just feel THAT would have set the stage for this gigantic match much more than not having two of the main stars of the thing even in the ring. Hacksaw is a crazy person who spent much of his time on air tonight thinly calling DDP gay. Seriously, what was with the “I wear real man clothes!” spiel. If you add that to the stuff Stinger was saying to Regal before the Great American Bash, the fact that these two PPVs have the word “bash” in them is starting to not look so coincidental. I definitely mirror Phillip’s thoughts on Joe Gomez. Sullivan said on his podcast that he basically hired the guy because he had a great standing in the community in Florida and was hoping to use that for relations with the Native American tribes down here. That’s why we’re seeing so much of the guy. I’d be okay with that if it wasn’t for the fact that he’s just a generic whitemeat babyface. He’s literally Create A Wrestler #5 with half of an Antonio Bandaras gimmick. I get it, not everyone can be Glacier, but still…gimmick this kid up a bit if you’re going to put him over as much as you do. Steiners VS Harlem Heat was good as always. This Tenta angle, however…can we just kill this thing already? He’s only getting the push because he’s Hogan’s buddy, but damn…he draws absolutely no fan reaction. For some reason we give X-Pac crap for having “I don’t want to watch you heat” when that dude was always entertaining and putting on great matches. Can we rename it to Tenta heat, please? I liked the Outsiders interaction this week. Had to bar them from the building if they’re paying customers. I like the crowd chanting “Diesel” and Bischoff trying to play it off like they’re chanting “Weasel” at Heenan. Everything the Outsiders are doing right now is gold and I’m loving it. Well, that’s it for today. Tomorrow we’ll be celebrating our ONE YEAR anniversary with a reflection write-up and the write up for the Bash at the Beach! Four in a row! WCW looking good! Still weird seeing an hour Raw against a two hour Nitro. HBK VS Jannetty could have been a pretty good match. I remember the New Rockers and Al Snow’s whole “stuck in the sixties” gimmick. I didn’t realize they were managed by Cornette, though. I’ll have to go back to that one. Odd that the champ is opening the show and not main eventing, though. Hello, ladies and gentlemen, and welcome to another edition of the Internet’s only chronological expose on WCW Nitro history! I’m joined, once again, by the Colorado Kid himself, Phillip. He’s taking a look into this episode, coming to us live from Cleveland, Ohio. I’ll be back at the end for my thoughts as well as for the ratings and Raw thoughts, but for now, I leave you in Phillip’s hands. Show officially opens, and we’re getting backstory on this Jimmy Hart payoff. I think I mentioned this in my last post, but Mongo needs to go, it’s like he and Heenan are trying to work the same angle, and they are both annoying. Onto this 3 way Triangle Tag.. This was all set up with the Steiners Debut where the Nasty Boys went to the Hospital and no one knew who did it. Some athletic action in this match. Scott still has that beautiful mullet. For a 6 man event, this match is beautifully paced. A lot of these matches work as distractions to avoid showing a lack of action or ring work. There’s a chaotic everyone brawling outside the ring moment, but overall some really good, well paced action. Bischoff throws a mention to the Steiners debut, and that setting up this match. Animal grabs a heel of Knobbs, but somehow even though every other touch of a man is a tag, this one doesn’t count… I love the suspension of disbelief that I clearly had as a young man. Watching this match, I’m sure this is going to be the highlight again. A really nice spot, Rick sets up a belly to belly on the top, and Hawk pushes them both over the top. Public Enemy comes out and runs some interference. Johnny Gunge dressed as Knobbs runs in the ring and takes the pin. It looks like Public Enemy mugged the Nasty Boys. Double A and the Taskmaster come out with Elizabeth and Woman. Elizabeth and woman come out looking like a walking 80’s glamour shot. The walking cartoon duo of Hulk and BM come out for the match. I think WCW’s April Fools joke is pushing BM as a star, and trying to sell Hulk as someone who still wrestles. The physique differences are pretty hilarious, it’s two stocky, chubby, pale dudes wrestling two bodybuilders, who spend half their day in the tanning booth turning their skin into tanned leather with a ton of bright colors. Woman digging into BM’s face. All of the offense is really BM and Hogan, but finally there is a shift, watching Double A job to Hogan and BM makes me feel a little ill. A couple of boots to the face, and Hogan has yet to take a bump. Hogan uses Booty Babe’s heel to take out Taskmaster. I have to say typing Booty Babe, makes it near impossible to not cringe, what a god awful gimmick. Post match there’s a little action. They tag BM, but Hogan still taking no bumps. Hulk and BM doing some tough Mic work. BM has a plan to get the “last laugh” there’s a lot of “brother’s” and “booty” and some threat to “kick a can”, won’t take bumps, can’t cut a promo… This is their star. Ric Flair in there Ric Flair’ing giving a “WOO!” and a strut. Flair taking some bumps, a big overhead slam. Another big overhead slam. I forgot how many of these matches were only slow ring movement and signature moves. Flair goes up top, and… Overhead slam. Clothesline, and clothesline over the top. Flair chops, and a Luger overhead slam, this time onto the ropes followed by… clotheslines. This match is like going to see Chumbawumba open for Alien Ant Farm and they only play “I get knocked down” and “Smooth Criminal” over and over. Knee block chop and Figure Four… Luger turning the figure four over… Flair grabs a rope and throws luger out, woman rakes the eyes. Luger clotheslines Flair. Sunset flip pin by luger, Flair kicks out at 2, missed hip toss and backslide pin, flair kicks out at 2, Luger catches Flair off the top, sets him up for a superplex. The Luger power slam, Torture Rack, Liz distracts the referee, and woman throws coffee in Lugers face, and Flair leans on the rope for the pin. Sting comes out to save Luger, while Flair celebrates. The highlight of this Match was the reminder that Flair is the dirtiest player in the game. Which is a part he plays well. Luger and Sting against the villainy of WCW, playing the hero part well. Overall impressions, This was a set up show to get some storylines started, the next few weeks will see these stories play out. Not a bad Nitro, but definitely more about story than wrestling. The ring work for the most part was ho hum, but you can see that they are trying to set a foundation leading to the next PPV. Thanks for your time, and I’m out! All in all I thought this was a pretty solid show. I’m not EXACTLY sure why Jimmy Hart is trying to take out Sting now, though, since Sting hasn’t featured in any of the main story lines for a long time. He’s busy with the tag team stuff, so there’s really no reason to pay off Harlem Heat to let the Giant beat him down. Plus, damn, Booker T, that’s cold. You and Sting were temporary buddies just two weeks ago! Nice to see Luger rush to Sting’s aid, though. Luger is pretty much going full babyface in the next few months, so we’re seeing that turn towards that here. Plus, Luger, even in his tweener role, does seem to genuinely care about Sting, so it’s not too much of a stretch. It’s nice to know that Luger has Sting’s back when it counts, though. Man, WCW’s tag team division is stacked! The Steiners, Road Warriors, American Males, Nasty Boys, Public Enemy, Harlem Heat…it’s so awesome to get to see a company where full tag teams are a thing. I’m so used to fifteen years of Midcarder A and Midcarder B being thrown together to be a tag team that I forgot what having a full roster of tag teams was like. This match, like most of the tag matches in the last few months, was pretty hard hitting. Phillip seems to constantly get Steiner Brothers matches on his write-ups, though, which makes me sad. I want to call some suplexes! The Steiners are, legit, my favorite tag team ever, so I’m loving them here. I know I don’t get but about a year of them…but I’m going to cherish it while I’ve got it! The Hogan/Booty match…ugh…I’m so damn sick of the Booty Man, I want to scream. Him trying to say the word “satisfaction” with this weird emphasis failed twice. It’s like he did it the first time, no one reacted, so he wanted to make sure that people heard him so he did it again! Thing is, he says it differently both times! Also, I don’t want to hear Hogan say “booty” anymore. I don’t want to hear ANYONE say it anymore. Sadly, we’ll get this match again next week. I also don’t want anyone to hit anyone else with a shoe anymore. I’m sick of this gimmick. The main event…yet another free World Championship defense. I understand defending the Television title every time you have a television show…but the World Championship is something you should pay to see. This goes for every company…then, and now. In a world where you can get access to ANY type of media you want, it sometimes seems like it makes sense to give the title away because you have to draw in viewers. However, that’s how you tarnish a title. They do title shots on Nitro every week and none of them feel special anymore. Title matches should be built up to, PPV main events, with Michael Buffer announcing. That’s one thing I can say about the time we’ve got coming up when Hogan gets the title…from what I remember, he only defends on PPV. Granted, he’s a heel and only defends in the mandatory 30 days, but still…he makes it feel special. But, I digress. Bobby Heenan seriously got me with his April Fools joke about this being his last night. I started wracking my brain (no pun intended) to try to remember if he took time off around this time…but then he gets to the end and I have to admit, he got me. All in all, decent show. Not stellar, but not terrible. Nitro takes a week off next week, so fortunately we’re not as behind as it looks like we are here. I hope to get the next two episodes up this weekend sometime and then go from there. See you all next time, fans! Back to a WWF win…but we’re about to turn the corner here into May. Those wins won’t be something we see too much of once that happens. Hey, look, it’s Johnny B Badd! Is this his official debut? I may have to watch that to find out as this is a decent sized ship-jump. It’s not as big as Vader’s was, but still. Doesn’t look like a terrible Raw, aside from Isaac Yankem being on TV, but still. I can see how this competed closely with this episode of Nitro.